wo wird man am besten Informiert wenn Upadtes raus kommen? Und man per OTA updaten kann. http://download.cyanogenmod.org/ da solltest du alles finden. Gehe mal davon aus weil im Titel cm steht das du ne cyanogen mod hast. (06.06.2014, 04:45)miru2403 schrieb: http://download.cyanogenmod.org/ da solltest du alles finden. Gehe mal davon aus weil im Titel cm steht das du ne cyanogen mod hast. 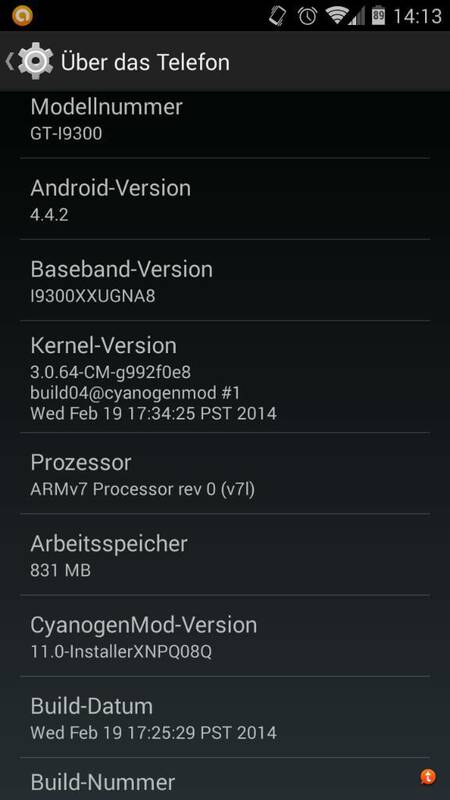 Du hast unter Einstellungen-Über das Telefon-cyanogenmod updates die Funktion danach suchen zu lassen. Jedenfalls is das bei mir so. Was hast du denn für ne cm drauf? So siehts bei mir aus. Dann wirst wohl auf der cm Seite schauen müssen ob was aktuelles da is oder flasht es mit philstouch direkt vom Handy aus. (06.06.2014, 14:55)miru2403 schrieb: So siehts bei mir aus. Dann wirst wohl auf der cm Seite schauen müssen ob was aktuelles da is oder flasht es mit philstouch direkt vom Handy aus. Mit flashen hatte ich bisher nichts zu tun, das ist absolutes neuland für mich.
Zitat: Release day is here again, with CM 11.0 M7 hitting the download servers. Last week’s post included the highlights from the changelog, but we’ll it again for those of you who prefer tl;dr. The non-device specific code was branched on May 22nd, giving us a bit longer than usual for our stabilization period. Device specific code was branched on May 31st. For those of you who jump between nightlies and M releases, the May 22nd branch point is the one you should be paying attention to. To get ahead of the inevitable questions, this release is based on Android 4.4.2. The 4.4.3 source has been merged into CM for nightlies, but given the source code was only made available last week, we chose not to rush the new code into the stable branch. There will be plenty of things to address with 4.4.3 in time for our M8 release next month. neues Update, schlägt der CM interne Updter Automatisch an oder muss ich selber aktiv werden? Standard is wöchentliche updatesuche und er zeigts dir an wenn was da is. Du kannst aber auch da ja fast täglich was neues kommt auch manuell nachsehen.